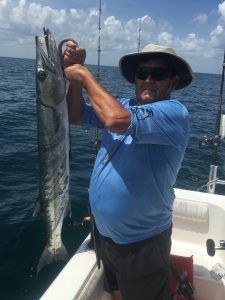 Send your fishing exploits to Ron Schmidt. Please include Pictures, if possible. I thought i would give a little report on the surf fishing at Tiger shores. The surf was great there was a lot of bait fish and we did catch a few croakers and whiting. Some were too small but i did keep enough for dinner. We met some of the PSLanglers there norm, mike. 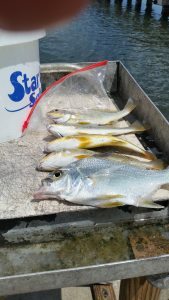 This was mike’s first time surf fishing but he did great catching the croakers and a irish pompano and Tom caught a nice whiting. Ken gave you his report and he gave me his nice croaker thanks ken the weather was great and all had a good time. So J. Nelson and I picked up some bait at Snook Nook at around 8am. We got croakers since they didn’t have any shrimp or pinfish. Left from the Jensen Beach causeway and headed up to the power plant. I started out with a red and white super spook on a light setup. Mr Nelson was fishing with live bait to start. We started at the power lines (pilings) and we got zip, so we move to the mangrove “bowl” where tarpon hang out there within 30min I hook up to a 4-5ft Tarpon 5 feet from the boat!! Jumps fully out of the water and spits the hook before I could set it!! 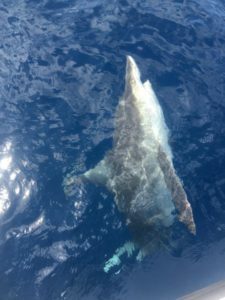 After that we caught a few jacks then started heading south, the wind was a kicking and the tarpon was a rolling it was hard to “walk the dog” since there was a bow in the line there was no chance. So we started heading back slowly since the waves were up to 2 feet, it took an 1 hour an a half to get near the causeway. 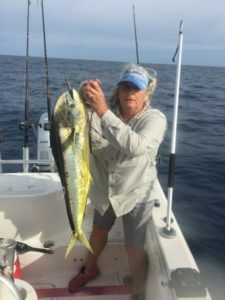 Once we got there we fished a little longer, Caught 5 jacks, 4 hard heads, and a “tarpon” for the last time fishing for a while it was very fun!!!!!!!! I took a group out to club reef and artificial reef 6 miles out of the inlet. The water temperature was 78 digress with only 10 foot of visibility. There were a lot of lane snappers on the reef as well as a lot of barracuda we also caught 2 fluke a 17” and an 18”. 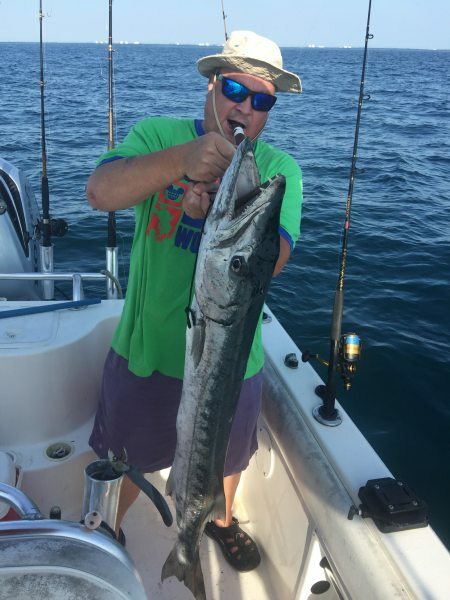 1 of our lanes got bit off just short of the gills and another had bite marks 1 side penetrated the flesh right to the back bone We took the head that was left and put it out with a sleet leader and caught a barracuda that was 49’ long. We netted the barracuda so we could return it to the water. I fished 4 days this week seas were nice and flat but the weed was spread out everywhere. 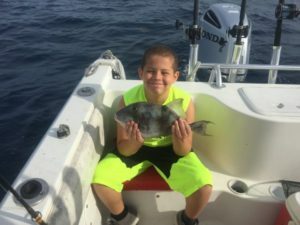 Typically weed doesn’t affect bottom fishing just the trolling trips but this week it was the worst I ever saw and even made bottom fishing a challenge. Water temperatures are also somewhat lower this year then typically we only had 81 degree water this time of year we are usually 85 degrees sometimes warmer. We were able to catch an assortment of fish. 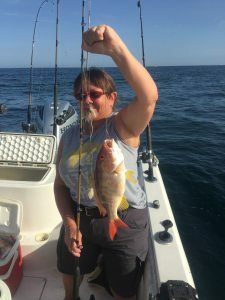 We had lots trigger fish, lots of black sea bass a few that were legal size, vermilion snapper, lane snapper, mangrove snapper, red snapper, dolphin, a 56” barracuda, 4 very large sharks each around 9 feet, bonita. Charles Brantley, Curtis Clark, and Ron Schmidt launched out of Sandsprit ramp at 0-dark 30 and went out of the St Lucie Inlet. Seas were nice with no choppy waves and just 3-4 foot slow roller. We found live bait about a mile out and caught a live-well full of look-down, blue runners, and small unidentified minnow type bait. We then went out about five miles and stayed in one spot. Clark caught a 3.5 foot shark, a keeper. 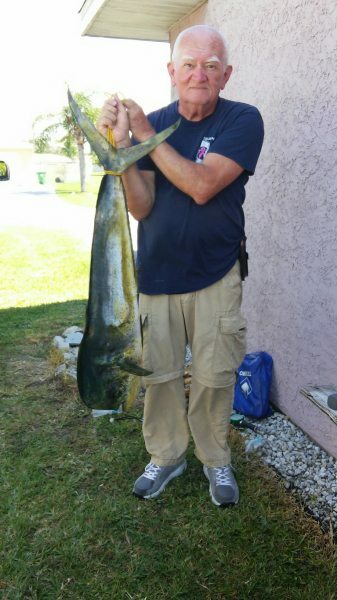 Then Ron hooked up with a Mahi-Mahi. 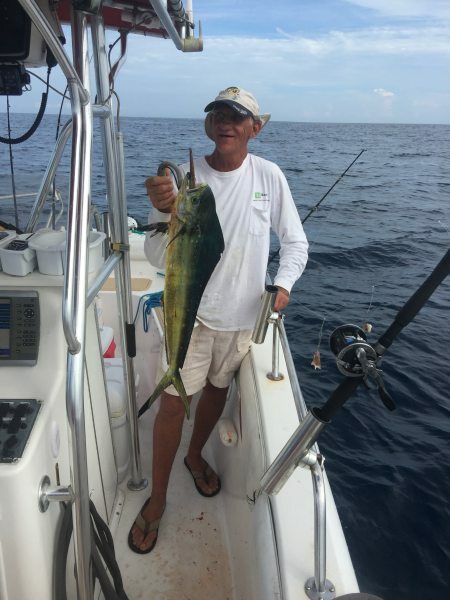 After a 30 minute fight, with the line being totally emptied from the spool, he finally got the 19 pound, 39″ to the fork, Mahi-Mahi to the Boat. A perfect gaff by Charles brought the fish into the boat. As we were returning to Sandsprit Ramp, we stopped just outside the Inlet at the right breakwater rock pile. Charles hooked up with a 5 foot+ Shark and finally got him next to the boat. Ron gaffed him, the gaff broke, the line broke, and the shark survived to another day. From his cuts and scars, that shark looked like he had several encounters with his bigger brothers. We motored back to the ramp and concluded a great day with 10 pounds of filets, thanks to some excellent carving by Charles Brantley. They went fishing at Frank’s “secret location” with some live bait and Paul caught a 23.5 inch Largemouth Bass. 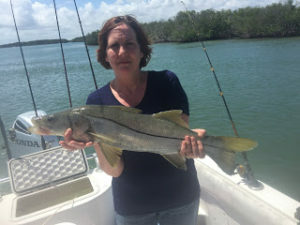 Additionally, they caught several (4) Snook, all undersize, and put them back. If you are curious about Frank’s ” SECRET LOCATION”, just ask him and he will take you there!!! Total of 15 bass caught. Chet Kitchen will be the winner with the biggest fish of 20″, weight approx 4#. There will be a 50 dollar award for each category. Also a special award for the biggest non-bass. James Watson caught a really nice catfish by the dam. Even though catfish were not considered tournament fish, I think a gift certificate would be in order. Thanks to all who joined us at Grape Hammock. We are returning in October so mark your calendars for the 16th, 17th, and 18th. I had charters trips 3 days in a row before the weather turned bad. The seas were flat. Great water clarity, maybe the best I have ever seen with at least 60 foot of depth visibility. There was very little current so we were able to fish with 4 once sinkers. I actually got a live line down with a 2 ounce sinker. The fishing was great as well. Tremendous variety of fish with some real nice ones. We caught black sea bass with a few being legal, several grouper with 2 being legal, a dolphin measuring 35”, lots of trigger fish with several in the 19 to 21 inch range, lane snapper, mangrove snapper with one that was just over 20 “ mutton snappers vermilion snapper, one tropical fish, several large sharks and of course lots of grunts. 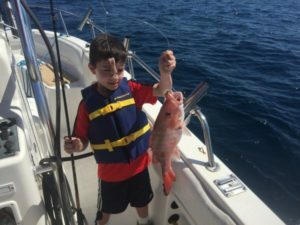 On one of the trips I had a 9 year old on his first time on the ocean. He caught a lot of fish including a nice size trigger fish. Went out to the snapper hole waves were flat, water temp was 74 degrees with great clarity. I bought live bait on the way out and brought cut squid with me we caught a lot of black sea bass all were to short to keep as well as a bunch of grunts which we also used as cut bait caught. We had 2 live bait on the top one on a float and 2 live baits on the bottom plus each angler had a bottom fishing rig. We caught some nice lane snappers and a real nice 25” mutton snapper. 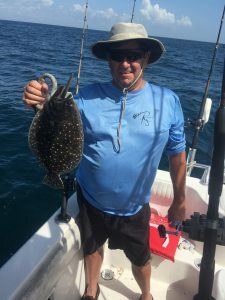 We also brought home a nice trigger fish at 16”. 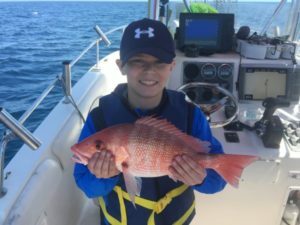 We caught and released several red snapper. The biggest fish of the day was an 8 foot shark which was released as well. My Neighbor and I decided to get out of the house and go fishing. Went to Normandy beach around 10:30 Waves were high but did not bother fishing. Started catching whiting a few at a time. Crabs were taking the baits. I was using a 9 ft. pole with a chicken rig and small circle hooks and Ron was using a very small light pole with a little hook and sliding sinker. 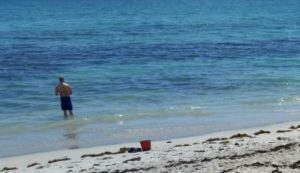 The tide was going out and fishing was slow till the tide turned around than the fish started really biting. Ron was catching most of them than so I switched to a lighter pole and smaller hook. We were catching them is the first trough. Went home at 2:00 with over 20 fish ( Whitting and grunts. Had over 4lbs of fillets. I took a father and his 2 sons out to the snapper hole. Seas were 2 to 3 foot and close so the trip out was a little bouncy, as the day went on they improved and turned into a real nice day. Water temperature was 74 degrees and clarity great 3o feet of visibility. Winds were out of the north there was a pretty strong current as well. We were using cut squid and cut grunt for bait. We hit 8 different spots each one had a few fish on them. 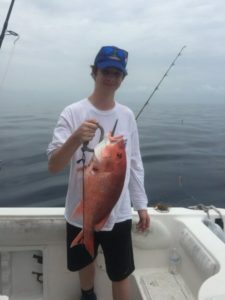 By the end of the day we had a real nice sea bass and several trigger fish in the cooler the boys also each caught a nice red snapper which I was able to vent and release. The seas were too rough to fish the ocean so I offered them a river trip. We got there early so we could buy live bait. We fished the turn basin, a commercial port 15 to 25 feet of water, and got some nice jacks but nothing we could put in the cooler. From there I ran toward the inlet and fished between the jetties, not even a nibble, just lots of weed. Next we ran north up the river and fished the grass flats, nothing just more weed. We still had live bait and some time left, so we fished an area right next to the boat ramp. I’ve seen some snook caught there in the past. We put the live bait out and in 15 minutes had 2 snook. 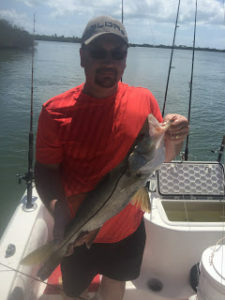 One snook was 27” and was released, the other was just over 28” in the slot. So we ran all over the place and caught the fish right where we put the boat in the water. Apr. 2 went out at 8 in the morning out of port st Lucie and headed out to 8 mile reef waves were higher than predicted. More large rollers that were over 4 ft. Put the trolling rigs out. Seen lots of boats and headed to that area which was Texas reef. over 29 boats in that area. Trolled around them thru the center. all around, did not see anyone caching any thing so pulled the rigs and went to 6 mile reef. Marked fish in 85 feet of water. Caught lots of lane snappers, vermillian snappers, sea bass, trigger fish and grouper which were out of season. By 12 I called It a day, cause this is the first time I got woosey on this coast. Guess captains are not immune to seasickness. Good day to get out of the house. And now a freshwater fishing report…. Charlie Brantley, Dave Brickey, a friend of his Darby, and I went to a small retention pond off Becker this morning to catch some bass for our kid’s fishing tourney. After a couple of hours we caught 13 bass, all in the 1/2 – 3/4 lb range with one in the 2 lb. range. Charlie continued on to hook up with Frank Gamber and Kurt Hoyer to try their luck at a pond by Walmart on Route 1. I, on the hand, just got a newly used canoe that I wanted to take the wifey out on its maiden voyage. We went to O.L. Peacock around 1pm, with a light breeze and absolutely beautiful weather. 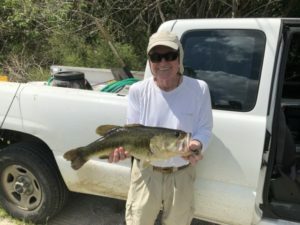 On the first cast, I landed a 23″ bass ( had tape measure) in the 5 lb. range ( no scale but anglers never lie…LOL). After cruising the lake getting used to the new toy, with a 45 lb thrust Minn Kota, and Humminbird fish finder that came with the canoe, we landed a total of 6, all in the 1-2lb range, with Claire getting her first ever large mouth bass! All were caught and released to catch again as is O.L Peacock’s rules!